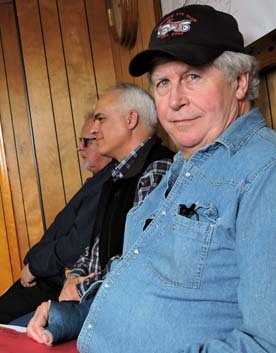 Graham Jaehnig/Daily Mining Gazette Keweenaw ATV Club Trail Maintenance Coordinator Mike McMahon (front) addressed the Keweenaw County Road Commission at Monday’s meeting to ask if the club can use Brockway Mountain Drive. Behind McMahon are Jim Vivian (middle) and Don Kauppi. MOHAWK — On the agenda of a special meeting of the Keweenaw County Road Commission Monday was the topic of ATVs using Brockway Mountain. While ATVs have regularly used the drive in the past, it is actually in violation of a county ordinance, and also state law, because there is no authorized trail to, from, or on Brockway. Commissioner Ron Olson said an ATV rider is allowed to get to and from a residence, or to and from a business using the edge of a roadway from an authorized trail, unless the roadway is a state highway. In Keweenaw County, those are M-26 and U.S. 41. 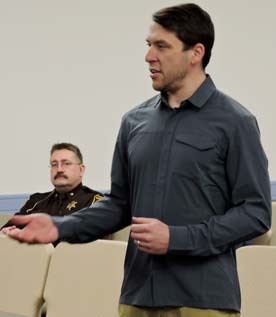 For instance, he said if a rider is on the Lac La Belle Road, or on a side street in Copper Harbor, or Eagle River, the rider can use that roadway to get to and from an authorized trail or a business in that town. In the case of Brockway Mountain, however, there is no accessible trail to or from the mountain without driving on a state road. Because there are no businesses or residences along Brockway Mountain Drive, it was not included in the ordinance. In addition to the question of county ordinance, the commission is also concerned with damage being done to the shoulder of the drive by ATVs. Keweenaw ATV Club trail maintenance coordinator Mike McMahon said the club has funding available to assist with road repairs, which set some commissioners at ease. 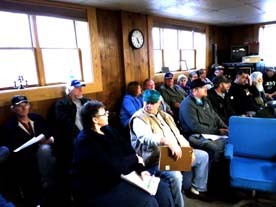 Commission Chairman Joseph Waananen said that in order to find a resolution, the ATV Club needs to ask county attorney Chuck Miller to review the ordinance to learn if it can be amended, then bring the topic to the County Board. The sticking point may be that it is state law that forbids ATV usage of state highways. The commission does not have the authority to dispense with the ordinance, he said.